If you've recently been injured on the job in Florida you've likely been bombarded with advice from friends, family, and neighbors about what you should do. Your job may be less than helpful in getting you proper medical care, and you may having issues getting in contact with your workers' compensation adjuster. Even worse, if the injury has put you out of work you may be having issues with paying your household bills. These are just a few of many concerns I hear from my clients. And it's no wonder...workers' compensation can be an incredibly confusing and complicated process. 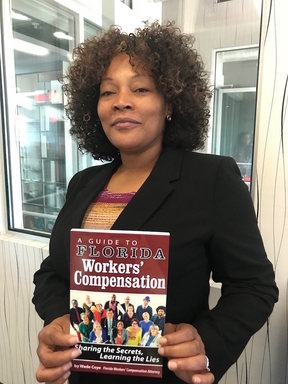 That's why I wrote the book: Sharing the Secrets, Learning the Lies: A Guide to Florida Workers' Compensation. And don't worry, this is NOT a book for lawyers or law students, it is a book for YOU – the everyday consumer. ​You won’t find any boring legal terms, legalese or “lawyer language” in my book. I explain everything in plain language and summarize the important takeaways and key points at the end of each chapter. "I Would Recommend This Book to Anyone. It's Very Informative!" To receive your absolutely free Workers' Comp book, just fill out the form below with your name and best e-mail address. You will receive an email with your free download shortly after submitting the form.